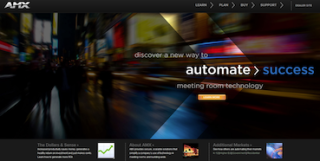 AMX is launching its new company website on March 1. The new site will be a new front end to the existing AMX.com Dealer Site that will continue to be available with no changes for day-to-day support of their businesses. According to the company, this new resource is being developed to assist in the time-consuming task of educating consumers about the benefits that technology automation can offer them and their entire companies to be more productive, more efficient and more able to focus on their best work. The new Website is defined from the IT Managers perspective and graphically illustrates the top technology priorities determined to be the most important to IT Managers in selecting the right solution. In order of importance, these include: enhancing productivity, return on investment, centralized management, ease of use, reliability, network centric, standards based, security, scalable, standardization and sustainable. Integrating automation technology helps IT Managers and the people in their companies to be more productive and more efficient, AMX says. Additionally, generating a healthy return on investment is also important. Cost savings can come from considerations like increasing workplace productivity, decreasing travel expenses and energy management savings. Centralized Management rounded out the top three considerations. Maximizing IT Manager’s extremely valuable resources by delivering a single, centralized, network solution is incredibly important. Launching March 1, everyone visiting www.amx.com will be routed to the new website. Any AMX integrators or other visitors who prefer the traditional site may quickly and easily continue on to the Dealer Site for business support, simply by clicking on the words “DEALER SITE” in the top right hand corner. If they prefer, visitors have the option to make the Dealer Site their default AMX.com. Integrators will always have the option to check out End User Site at any time, simply by clicking “END USER SITE” on the Dealer Site. This may be necessary when introducing new clients to the new resource.